When I’m reading, I almost always (maybe despite the best efforts of Mrs. Houston, the wonderful 7th grade teacher that introduced me to Dickens and Twain) look back and see the foreshadowing moments only from a chapter or two down the line. This happened again as I read the news about the teacher protests in Rio and São Paulo. 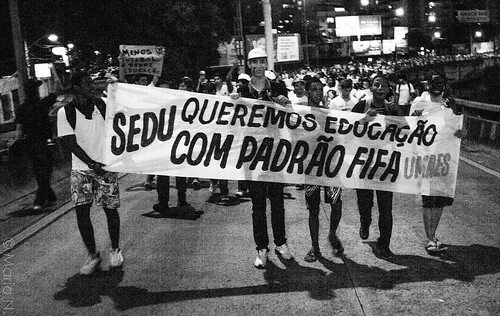 I began to remember all those placards that kept appearing, all over Brazil in the height of the first phase (it’s not over, not by a damn sight) of the protests, asking for schools and education that could meet FIFA standard. Observatório de Favelas, in their publication “O Que É A Favela Então?” (What Is a Favela, Then?) provides “educational indicators…below average” as one of the defining attributes of favela life. In a blog post earlier this year, Observatórios’ Artur Voltolini reminds us that Brazil’s 1988 constitution includes education as a fundamental right for all Brazilians. However, he goes on to report continuous abuses of the state interfering in the education of favela residents apart from the daily scarcity of infrastructure and resources that drew favela crowds to draw connections between state neglect and abuse in education and basic civic life. The connections that led them to join their numbers to the teachers’ protests. Banners: “Education on Strike” with “All Communities United Against [Forced] Removals” Click through for source article. By the way, speaking of things as Freire would want them: his complete works are available for free digitally. Click through for more.